AMD gave a presentation at Hot Chips 30 earlier this week in which it discussed the existing Raven Ridge APUs. 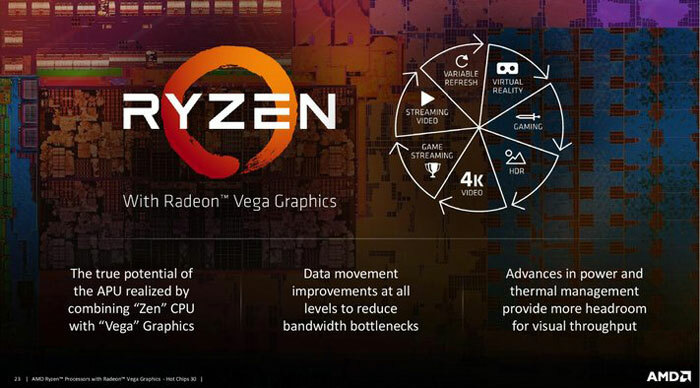 This news won't excite many, as HEXUS reviewed Raven Ridge APUs back in February, when the AMD Ryzen 5 2400G and Ryzen 3 2200G were launched. However, the presentation contained a single slide tease that indicates there are new Raven Ridge APUs lined up for release later this year. Tom's Hardware spotted the pre-announcement slide (pictured directly above) and shares it, alongside the full desk, in its write up of this news. As you can see, the new 'Raven Ridge 2018' processors will shortly succeed the Raven Ridge 2017 APUs on the AMD 25x20 chart. 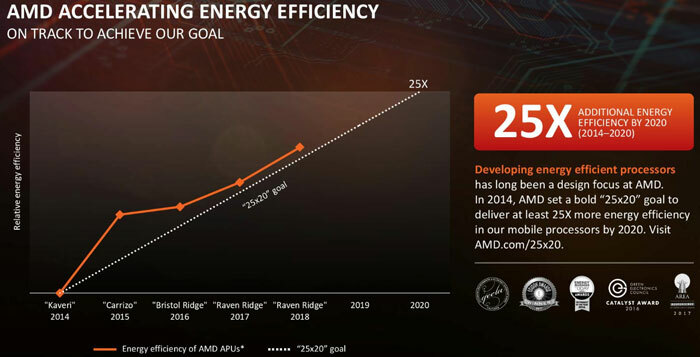 As a reminder, 25x20 is AMD's goal to increase processor energy efficiency by 25x by 2020. This goal was set in 2014 and AMD claims to be ahead of the curve in reaching the achievement on time. If you head on over to the linked page, you will see that an official webpage graph also makes reference to the 'Raven Ridge 2018' being the present state of play. In the top chart you can see that energy efficiency is the most notable improvement with 'Raven Ridge 2018', that we know about. Tom's reckons that this could be delivered by a die shrink - the new processors could be 12nm parts it is thought. A third party has leaked some information that could be a sign of things to come. HP has recently described a Pavlion AiO PC which comes packing a choice of several processors from AMD, with two of the most interesting options being the Ryzen 5 2600H and Ryzen 7 2800H. The source article explains that "AMD uses the same Raven Ridge die for BGA-mounted mobile chips and socketed processors for the desktop," which means we could see a derivative of this processor land on the desktop. You will see all the other options are APUs and these 'U' suffix APUs, like the Ryzen 3 2300U, are 'mobile processors'. Think you may be getting ahead of yourselves here - wouldn't Raven Ridge 2017 be the original 2200G and 2400G, and the Raven Ridge 2018 be the more energy efficient 2200GE and 2400GE that appeared quietly a month or so later, mainly intended for OEMs / small form factor stuff? That would mean that we have had out lot of Raven Ridge for this year, Would also make sense, as although these were still in silica Ryzen 1 parts, they got the 2 name convention as AMD knew they would be on sale alongside the other Ryzen 2 series. If we're going on lunch dates and not availability then, no. The 2200G and 2400G launched back in Febuary 2018 and the 2200GE and 2400GE launched in April 2018. I'm guessing the article means the Raven Ridge from 2017 was the 2500U and 2700U that launch in October of that year. Note that the final slide with the testing details says that the Raven Ridge 2018 has not been released yet. I think it might be you are a tad peckish. IMO likely RR 2600/2800H are based 100% on Ryzen 2xxx (far as I know technically ARE 2018 model year on 12nm.